We are now only a matter of weeks before Houdini's The Grim Game returns to movie screens with the world premiere of Rick Schmidlin's restoration at the TCM Classic Film Festival in Hollywood, March 26-29. 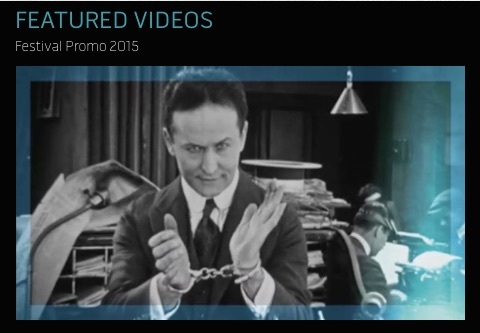 Now you can get your first brief glimpse of the long lost Houdini film at the festival website. The latest promotional video on the main page contains a mention of the movie along with two quick clips starting at 00:40 and, well...CHILLS!!! I know a great many of you are dying to know details of The Grim Game screening -- time, place, how to get tickets, etc? I know some of you want to make travel plans. All I've been able to nail down at the moment is that the screening will take place on Sunday, March 29, the last day of the festival. It will be attended by restorationist Rick Schmidlin and musical composer Brane Živković. As far as tickets go, it looks like the best way to see the film is to get a festival pass, but those aren't cheap, and its not yet clear which pass includes admission to the Houdini movie. However, I've been told by friends who have attended the festival in the past that individual tickets are sold at the door at the time of the screenings, and they rarely sell out. But this is depending on the theater size, and it's not yet known where the Houdini film will screen (please be at the Chinese!). Everything else there is know at the moment is on the TCM Festival website. I will keep drilling for info and report what I can as soon as I can. It's getting exciting! UPDATE: TCM Festival details: The Grim Game screening at the Egyptian, March 29. Wow! Thanks for the link John! You can now see Houdini actually move in that famous prison still where he's wearing that white shirt with cuffs and leg irons. I also love that second clip. I believe that is the first escape in the film. Some fellow reporters lock Houdini in handcuffs as a joke. I love that he looks directly into camera, as if to say, "Think so?" By the way, that still of Houdini in those cuffs looks like it was filmed when Kellar was visiting the set. Harry's appearance is similar to that photo in Joe's Circumstantial Evidence blog. The suite and tie certainly appear to match. I believe the set we see HH and Kellar on is Harvey's apartment. This is him in the newsroom. Although it's very possible these scenes were shot on the same day on sets that were both at the Famous-Players/Lasky studio. I can see already this film way outshines Houdinis other films. This will be shown on tv this year correct? Will it be available for purchase? It will certainly eventually be shown on TCM, but I don't know when. Hopefully it will also be released on DVD at some point. I also do hope it will be released on DVD ! Fantastic quality. Many thanks. The master in action. The anticipation grows. Can't make the festival. When will it air on TCM? They haven't announced an air date yet. But I will certainly report it here when I have it.